Treasure Hunt at Bina until January 1st. There are two lucky toilet chairs, one on each level, at Gor Gurls that rotate through several different outfits every 15 minutes. Here are two of the prizes you could win. Outfit: “Gor Goes Rosey - blue/violet” free lucky toilet prize at Gor Gurls. Skin: “KARA sKiNE02” group gift dated Dec 26 from Mother Goose, join and check notices. Hair: “Stripped – Blonde B” one of several styles for 10L on the upper level at Magika and will be discontinued after the holidays. Outfit: “Gor Gets Cross - Green” free lucky toilet prize at Gor Gurls. In the basement of INDI designs you’ll find not only several complete outfits marked down to $150L but also two boxes called Goodies for Men and Goodies for Women available for just 1L. The men’s box contains 10 outfits, here is a sample. Outfits: “Goodies for Men” box for 1L in the basement of INDI Designs. Skin: “Michael Skin w chest hair - Very Dark Tone” gift on the table at Flirt Skins. Eyes: “DIMENSIONAL – twilight” part of the KMADD VIP Christmas group gift. Hair: “~ JUDE ~ Irish Coffee” part of the KMADD VIP Christmas group gift. Search for KMADD in groups to join. KMADD is one of the most generous groups for men with frequent group gifts. Bina is celebrating their third year in SL and the opening of their new sim with a treasure hunt. The hunt is on until January 1st and includes 12 prizes ranging from a medicine bag necklace, a cartographers desk set, a ladies chair with sewing basket, slave livery and this free woman’s pauper outfit. The prizes are hidden all over Bina's new sim so you'll have to explore. There are also some lucky presents under the tree and lucky chairs in some of the buildings. Outfit: "FW Pauper" treasure hunt prize from Bina. Skin: "Maya Protoype - Pale Glamorous" group gift at Free Speerit. 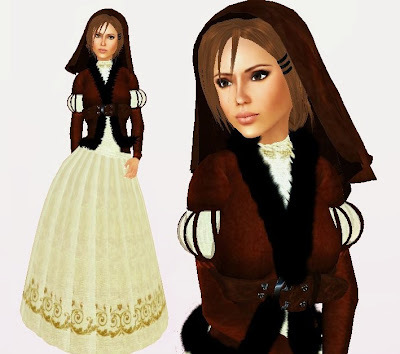 Le Petit Chaperon Rouge has created this outfit, with fur trim detail on the jacket and a head scarf, placed it near the teleport location of Glorious Ar as a gift. You may already know Magika has marked everything on the second floor down to 10L including dozens of hairstyles. Act fast all the items marked down will be discontinued after the holidays. Under the tree at Free Speerit are gift boxes containing prototypes of the Maya skin. You must have your group tag on to claim the gifts. Outfit: ``Glorious Ar Freebie`` gift created by Le Petit Chaperon Rouge available at Glorious Ar. Visit Le Petit Chaperon Rouge's market stall at Glorious Ar to see their other creations.